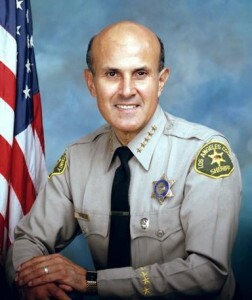 LOS ANGELES — Federal prosecutors announced Tuesday they plan to retry former Los Angeles County Sheriff Lee Baca on corruption charges stemming from his alleged involvement in an effort to thwart a federal probe of misconduct by sheriff’s deputies in the jail system. On Dec. 22, a six-man, six-woman jury deadlocked on charges of obstruction of justice and conspiracy to obstruct justice against the 74-year-old former lawman. Jurors said the panel was split 11-1 in favor of acquittal. U.S. District Judge Percy Anderson declared a mistrial. The judge suggested that the “complexity” of the case, particularly difficulty grasping the concept of “intent,” played a role in the jury’s inability to reach a decision. He said he also considered possibly effects of exhaustion. During a court hearing Tuesday morning, prosecutors said they want to try Baca again. Anderson said he wants opening statements to be given on Feb. 21, but a date was not immediately set for the start of jury selection. Anderson also said the re-trial would be on all three charges against Baca — the obstruction and conspiracy counts, along with a charge of making false statements to federal investigators. The false statements charge was not included in the first trial, with Anderson ruling previously that Baca would be tried separately on that count. Prosecutors contend that Baca so resented the federal government’s jails probe that he attempted to force the FBI to back down by illegally having deputies confront the agent at her apartment. The prosecution also alleges that Baca ignored years of complaints about excessive force used illegally against jail inmates in county facilities managed by the Sheriff’s Department. The judge originally planned to hold a separate trial on that charge after agreeing to allow testimony by an expert on dementia — but only as it relates to the false-statements allegation. Baca’s attorneys said the former sheriff is in the early stages of Alzheimer’s disease. In closing arguments of Baca’s trial, a prosecutor told jurors that Baca “authorized and condoned” the conspiracy to thwart the federal probe, but the defense threw blame on Baca’s former second-in-command, former Undersheriff Paul Tanaka. Tanaka was convicted last year of conspiracy and obstruction charges and sentenced to five years in prison. 1 comment for "Baca to be retried on corruption charges"
Well, here we go again. Let us see if Feds will bring in their A game this time or strike out again. If they fail again they will go for a lesser charge just to get a conviction. Still would like to see the transcript on this case.